Paudie Walsh is a DJ from Cork servicing weddings throughout the local area including Munster, Connacht, Leinster and Ulster. 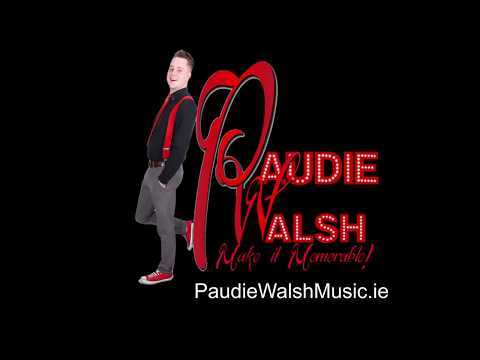 Paudie Walsh is a Wedding DJ that has been part of the DJ industry since 2010 specialising in Weddings. Thanks a million Paudie for everything,I would highly recommend you to all future wedding couples. The music was on point and all our guests thoroughly enjoyed themselves and danced the night away. Paudie thank you so much for playing at our recent wedding i cant explain how good you really are, it was the favourite part of the wedding and the best money spent, most DJs just arrive at 12am and play for 2 hours but you come at 8pm and stay the evening watching the crowd seeing what everyone likes and then put on a performance, everyone raved about you all weekend, Thanks you for my making our wedding so much fun. Paudie was a pleasure to deal with start to finish! !Everyone was raving about him after the wedding and one of our friends tried booking him at the end of the night for her own wedding in July even though she had a DJ booked! !Dancefloor was absolutely hopping from start to finish,couldn't recommend him highly enough! Paudie’s fun personality and friendly smile along with his great choice of music had the dance floor full all night! I would not think twice in recommending Paudie to anybody planning their wedding and looking for a D.J. Paudie is excellent at what he does and had the dancefloor full all night at our wedding last Friday. Paudie was great to deal with from the start - very helpful, quick to respond to any queries and very friendly. Also suggested some wedding bands for us to book. On the night the music was great! So, 2 weeks out from our big day, our previously booked Dj calls me to let me know that he’s double booked and can’t play - panic stations were manned shortly after that chat. Having searched online and talked with a couple of Djs I got through to Paudie and the conversation went so well that I suspected that what’s happened might be a blessing in disguise - and I was right as Paudie was superb. Everything from his professionalism in the pre event planning and our desired music style conversations to his professionalism and delivery on the day could not have been better. His ability to take control of the direction of our guests to our first dance and his natural gift on the mic is highly admirable! Jeez - even his song choices were spot on! Paudie was brilliant and as I told him already, I’m sure our paths will cross again as a couple of our friends are keen to book him in future celebrations! Paudie was outstanding last saturday night for our wedding in Ballygarry House Hotel. From the minute i booked paudie he made it all so easy and was a pleasure to deal with. He rocked ballygarry with all the classics and took us right back to our days in the hi-land???? he is a DJ who def knows how to get a crowd going and is very professional. highly recommend paudie. WOW! Siobhan & Eoin, thank you so much. That is amazing. I was delighted to be part of your day and thank you so much for having me. It was a great night from start to finish and I was really happy with how the end of your wedding night turned out. Hopefully I will see you again at a wedding in the future. The best wedding DJ I’ve ever experienced. Played exactly the style of music we requested and kept the dance floor full all night. Worth every penny and more. Top quality and a really nice guy. Would be top of my recommendation list for any couple who are getting married. We really can’t speak highly enough of Paudie! We had heard good things but he even exceeded our high expectations. The dance floor was packed with people dancing that we’ve never seen dance before! Also loved that he came early to watch the crowd with the band and tailored his set to suit our guests. A lovely guy to deal with and we highly recommend. We are so happy that we chose Paudie as our wedding DJ. In the lead up to the wedding, Paudie was very responsive and open to answering any questions we had. He was friendly and professional. He was there early and ready to go on the night as soon as the band finished.He had a great selection of music and was able to pick music that suited our crowd. There was music to suit everyone and he had everyone dancing from the first song.He created a brilliant atmosphere. Everyone commented on how much they enjoyed the music after the day. We cannot recommend Paudie enough. Thanks so much Paudie! We could not say enough about Paudie. He was absolutely fantastic. Paudie goes way above and beyond the job of a DJ. He is so entertaining and engaging and our guests were raving about him. So much so, he got several bookings on the night from couples getting married! We requested some songs, each of which were played. He set up all his gear when the band were setting up so there wouldn't be a seconds delay when the band finished to when his set started. He accommodated us by playing our first dance through his system as the band didn't know it to play it. Paudie is professional, fantastic to communicate and just an all round nice guy. He helped to make our night one we will remember forever. 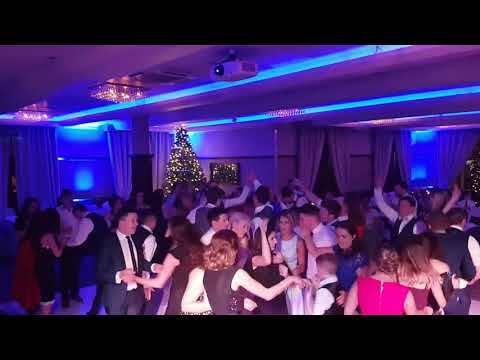 We had the pleasure of having Paudie DJ at our wedding on 1 December 2018. 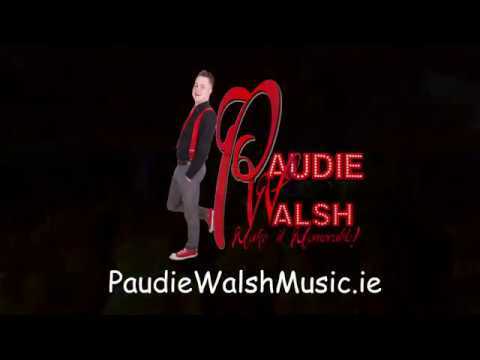 We booked Paudie after hearing him at a 21st and we are so glad we booked him. From the moment we booked him he was an absolute pleasure to deal with. In the run up to the wedding, Paudie really took the time to chat through how he operates and what kind of music we wanted him to play. Paudie set up early in the night with the band to get to know the crowd which I think made a huge difference and the minute the band stopped, Paudie started there was no break. 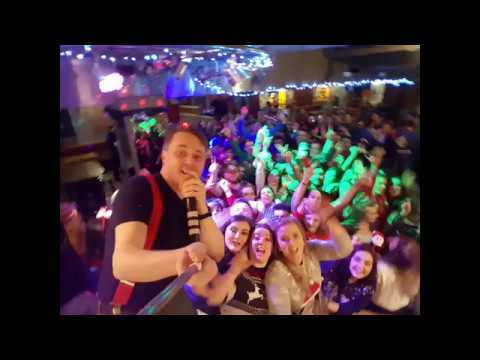 Paudie is more than just a DJ, he’s an entertainer. Paudie was out on the dance floor getting everyone involved. He’s extremely professional & pays huge attention to detail. All our Guests commented on how brilliant he was! He had the floor hopping all night. Couldn’t rate him highly enough! Paudie was absolutely fantastic to deal with and all of our guests are still raving about the set he played at our wedding. He has a great sense of what will keep the crowd going and the dancefloor was packed all night. We had heard him play at a wedding that we were guests at and we asked Paudie for a card that night, before we even had the date of our own wedding sorted! He's that good! Omg paudie is brilliant he was fantastic on the night, everyone loved him and people are still talking about how good he was, hes really good at reading the crowd and playing what suits, hes so easy deal with pre wedding as it's a stressful enough time. Could not recommend him enough don't think about it just book him!!!! WOW WOW WOW! Paudie was absolutely superb! The dance floor was full the entire night and he played everything from 90's dance to Abba for the parents and everything in between. We had a few songs we didn't want played and a few songs we definitely wanted played and Paudie incorporated everything we asked for. The next day everyone said he was the best DJ they ever heard at a wedding! One of the girls wanted to ask Paudie to stop playing for a few minutes because she needed to sit down but the music was too good! Word of advice, bring flat shoes because you won't stop dancing! Great music and vibe, very professional and reliable. Very individual, checked with us what music we like and also looked into hitlists from abroad as we had guest coming over from other countries. Thanks for a brilliant day! Paudie was excellent to deal with and extremely professional. He made our night memorable and had the dance floor full. He catered to all our musical needs and catered for all age groups and nationalities. Thank you for a fantastic night ! We met Paudie at a wedding fair and I knew immediately that he had a great love for his job and trusted him 100% with entertainment for the night! He was fantastic, so approachable, great communicator and just so invested, makes you feel like the only couple getting married! Paudie was an absolute dream to work with. From the very moment we booked him. He has been so professional and friendly on every dealing we had with him. The dance floor was packed for the night and we have gotten so many compliments from our guests. Paudie provides more than music... he brings fun as well!!! Thank you so much ???? We had Paudie for our full wedding, he kept the guests entertained all night and catered for everyone's needs. 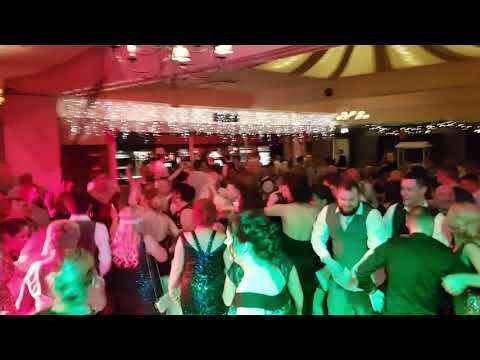 Paudie Walsh was a fantastic DJ/entertainer at our wedding, he had everyone on the dance floor from the minute he started till the end. A really nice guy who was professional from the minute we booked him to the end. I would highly recommend Paudie for any wedding/ event. Paudie was excellent,the crowd and us loved his playlist and set. 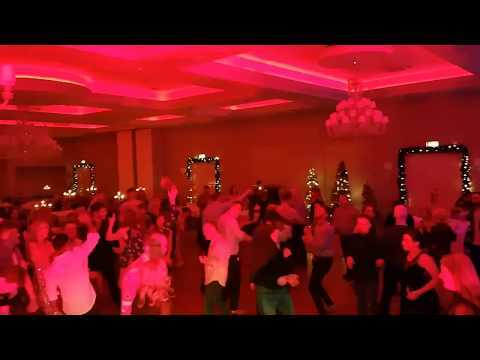 Danced the night away!We would highly recommend Paudie. When we started planning our wedding we weren't too bothered about having a DJ, but when we saw Paudie at a friends wedding last year, we very quickly changed our minds. The dance floor was full from start to finish and that's what we wanted for our wedding. As regards our wedding Paudie was a pleasure to deal with from the minute we booked to the end of our wedding. He played brilliant music and people are still talking about him. He has such a pleasant manner about him and we felt like we had known him for years. Paudie even dressed up for the occasion which we thought was a lovely touch and he interacted with the crowd. The dance floor was packed for the night. He made such a fuss about us on the night as well which was lovely. I would highly recommend Paudie to any future brides and grooms. He is such a professional and for what we paid I feel he went above and beyond for us. Thank you so much Paudie. Loads of energy and extremely fun!!! We were dancing all night! One recommendation is to play some songs fully through instead of snippets of songs in a sequence, but overall amazing! Thanks Paudie. Paudie was a brilliant DJ, the dance floor was full all night long. From the first phone call we knew he was the DJ we wanted. He was so good I couldn’t leave the dance floor. Def 100% the best DJ I have heard. We would highly recommend him to all future wedding couples, ye will not be disappointed! We couldn’t have asked for a better night. Paudie is an exceptional dj. He is so pleasant to deal with. Everyone at our wedding complimented on how good he was and how he engaged with the guests. If a song was playing and no one was dancing he would move along to the next one. He was always contactable throughout the wedding planning process and always replied to any queries quickly. Paudie loves what he does and is very interested in providing a top quality service. We would highly recommend Paudie. Paudie was brilliant from day 1, he was highly recommended by a friend of mine n we can see why. He was very friendly, accommodating and down to earth, and on the night was full of energy and the dancefloor was hoppin all night ???? 10/10 Paudie ???? Everyone had a great nite ???? Paudie was a fantastic DJ for our wedding. Very clear communication prior to our wedding day which was a great piece of mind. We left song choice mostly up to him and glad we did, he played a fantastic mix for all our guests on the night. Would Highly recommend. I have absolutely nothing bad to say about Paudie. He did an AMAZING job picking out the music, and setting a good tone for the night. I could NOT be happier with who we picked out to be our DJ. I even requested a few polish songs that he had right there to play for us and everyone had great fun!! I don't think the dancefloor was empty even for one song. I know I danced to every song myself! Night to remember! I could not recommend him enough! Paudie was fantastic. He arrived in plenty of time so that when out meal finished he was there. He set up the photo booth and brought someone along to run this for him. When the band were setting up he also set up too so that when they finished there was no delays he started straight away. He was great at interacting with the crowd and got everyone dancing. He watched the type of music people liked and assured to cater to all different age groups. I would highly recommend paudie to future couples getting married. He provided a fantastic service from start to finish. Paudie was great to deal with from start to finish. Really helpful and professional. He turned up early to see the band on before him and what kind of music was getting the crowd on the floor. He played a great mix of music and kept the dance floor full for the whole night. Can't recommend him highly enough!! Overall we were thrilled with Paudie. Being a crowd from overseas and a smaller wedding he managed to inject a great atmosphere where people were not pushed to dance. Paudie contacted us in advance and was really easy and professional (yet personal) to deal with. You’ll struggle to find better. Paudie was very professional in the run up to the wedding, and kept the floor full all night. We are delighted that we chose Paudie, and friends are still commenting on how much they enjoyed his DJing! Paudie was amazing the night of our wedding had everyone on the dance floor all night! Can’t thank him enough! Would highly recommend! All we can say to anyone considering Paudie for their wedding is, you will not regret the decision. Paudie is a true professional. We had him for the whole night instead of a wedding band and we would do it all over again. Our dance floor was full all night, the place was rocking!! He played every song we requested but also catered to the crowd on the night. We had a fantastic night and we can’t thank him enough. We would have no hesitation in recommending him to anyone. Thanks again! We were so happy we booked DJ Paudie for our wedding in the Woodlands. He kept the dance floor hopping all night. Not only was his song choices amazing he also interacted so well with the crowd and all my guests were raving about him! Thanks for everything Paudie! Savage! Hopefully see you soon! Absolutely thrilled we picked Paudie to entertain at our reception! The dance floor was full all night, great music to suit all age groups. Paudie interacted so well with the crowd making our day one which we will never forget! Thanks a million Paudie!! I cannot praise Paudie highly enough. He was so entertaining and had everyone on the dancefloor from start to finish! His setlist was brilliant and he really made the night. He was so professional to deal with and wanted to accommodate us in whatever way he could. So many of our guests asked us about him the next day! Thanks Paudie! We booked Paudie as our dj for our wedding and we booked him for the full night. He kept the floor full all night and many of our guests mentioned they never danced so much at a wedding before. He played music to suit young and old. He was very professional from start to finish. I would highly recommend him as you are guaranteed a great night. Thank you so much for making our day so special. DJ Paudie is a natural at what he does. From the first phone call we knew he was the DJ we wanted as he was so personable and positive and you could sense straight away that he takes his job seriously and that he also loves it! Making contact was always easy and he was great to give advice. On the night he was just FANTASTIC!!! The floor was full continually as he mixed his music so cleverly and really catered for all the crowd. We still have guests raving about Paudie and the serious craic on the night. I would highly highly recommend Paudie and having seen him at two other weddings I can tell you that he gives it everything every single night. He is a true professional at what he does and a true gentleman too with a great sense of music and fun! Thank you so so much for a night we and our guests will never forget Paudie and continued success to you. Paudie was a brilliant DJ, the dancefloor was full all night. He was very easy to deal with in the lead up to the wedding and we would highly recommend him! Paudie was absolutely fantastic. From the moment we booked him he was completely professional. He was always very approachable and contactable and responded insistently to any quiries and song suggestions we had. Paudie is more than a DJ, he is an entertainer who is full of energy. He engages everyone from the beginning and shows genuine interest in providing the perfect music to suit all tastes. We received plenty of compliments and enquires about Paudie on the night and days after! I would highly recommend him. Thanks a million Paudie! This man added something unique and special to our wedding day that from us and our wedding guests are still for weeks and months going to talk about how outstanding and one of a kind entertaining Paudie was! The dance floor was full from start to finish! The atmosphere was what ever age Paudie had us all on the floor enjoying ourselves! Paudie was absolutely brilliant and we both can not recommend him enough. The dance floor was full from start to finish and the only complaint I would have is that he was so good I couldn't leave the dance floor ???????????? 100% the best DJ I have heard. All our guests wanted to know who he was etc and no doubt we will be seeing Paudie again in the future ???????????? Paudie is simply the best DJ by far!!!!!! Professional throughout and always contactable. THANK YOU so much for making our night...I don’t think we left the dance floor once! So pleasant and helpful throughout. You made sure the crowd were on the floor all night and catered for absolutely everyone! Thanks again for making our day even more memorable! You played exactly what we wanted! I can’t recommend you enough! All our Guests commented on how brilliant you were! You had the floor hopping all night with some awesome tunes! I will be recommending you to EVERYONE!!!! Thanks again for making our night...we could not have asked for anything better! Just wish we could do it all over again!!! Paudie is just fantastic to deal with so friendly and professional we couldn’t recommend him any higher he made the night and the dance floor was full all night just fab!! Paudie was a complete professional to deal with from the very first email to the last telephone conversation! A pure gent behind the scenes and a maniac on the dance floor! The minute the band finished, he was on his feet keeping the crowd entertained from start to finish! He played all types of music to balance all ages! We would highly recommend him to all future wedding couples, ye will not be disappointed! Hi Marie/James. It was so much fun to play for your family and friends. I am so glad you all enjoyed the night. It is important for me to start as soon as the band finish and I am delighted you noticed. No doubt I will see you at some stage in the future. Paudie P.S Thanks for inviting me back to play your Day 2! I honestly can not recommend Paudie enough. The floor was never empty! He played music to suit the crowd, young & old were on the floor for the night. Also, he was so lovely & professional to Dea with. 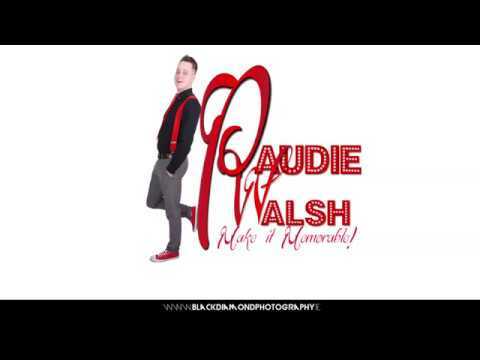 I would highly recommend everyone to book Paudie Walsh! Paudie was absolutely brilliant, we booked him as our DJ and also to supply the photo booth. Paudie was professional throughout our dealings with him on the run up to the wedding and on the night kept dance floor full starting from the moment the band played there last set. We couldn’t have asked for a better night. What can we say only WOW. Paudie is brilliant. He was a pleasure to deal with. He played at our wedding on the 4th May and he played an absolute blinder. The dancefloor was full all night with all the great tunes he played. He really interacts with the crowd to get them goin. All our guests were full of compliments on how great he was. Thanks so much. We would highly recommend you. Paudie was such a pleasure to work with. He kept the party going all night! We can not recommend him enough! Amazing music choices. Responds quickly to all questions. All in all amazing night because of Paudie! We had chosen Paudie having seen him in action at our friends wedding and we weren't disappointed. In the run up to the wedding, Paudie really took the time to chat through how he operates, how we wanted the night to play out and all the other finer details. Really looked after the upfront organisation so that we didn't have to worry about anything ahead of the big day. He was excellent on the night, he's more than just a DJ, he's a first class entertainer. Paudie knows how to accommodate for all ages & musical tastes in a room as the dancefloor was full all night. He was out in the thick of it getting everyone involved. He's extremely personable & pays careful attention to detail. Couldn't rate him highly enough. We had met Paudie at a friend's wedding a few months before we got engaged. We immediately booked him as he blew us away. In the run up he afforded us more headspace for other jobs as we knew he would deliver. His key skills are his personable nature and his ability to read a dancefloor to ensure it remains full! His energy and his interaction with the dancefloor is brilliant, he really gets involved and brings everyone together. On our night, he told the crowd something that we had requested at our friend's wedding the year before. The fact that he could recall that and remember it to mention at ours just highlights his passion and skills for his work. I must organise another event so that we can book him again! Paudie’s enthusiasm is what you want in a dj! We would like to thank dj Paudi Walsh so much for such a fantastic night. He was amazing and we couldn't have been happier. The atmosphere was Brillant and the floor was full all night. The sing song he created at the very end was unreal and we will never forget it. We would highly recommend him and I am sure we will see a lot more of him at our friends weddings. Thanks a million to Paudie. He was brilliant and had all my guests out dancing their feet off! It was exactly what we wanted! Great memories also from the photo booth. Love the album. It was the best night! I highly recommend Paudie!! Paudie was absolutely amazing! The floor was full all night with him. All the guests raved about him. We were so impressed! We had seen Paudie at a wedding two months after we got engaged and knew we had to have him at our wedding. It was like going back in time playing all the 90s hits the floor was full from start to finish as it was impossible to sit down, with every song better than the last. Just when you thought the place had gone as mad as they could go he would hit us with another classic. The complaints have flooded in all week our guests took a number of days to recover as did we from the pains from dancing. Paudie you added so much to our night everyone was so delighted. Thank you so much. Absolutely recommend Paudie he doesn’t win all the awards he has for no reason. Excellent DJ and great fun also! If you're looking for a top class Wedding DJ then Paudie is your guy.. From start to finish he was fantastic. He kept the guests on the floor and they loved it.. Absolutely Brilliant. We had our wedding on 2nd March #stormemma #beastfromtheeast but he still went above and beyond to be at our venue. Thanks a million. what a DJ, the crowd loved him the interaction was great and very entertaining. so professional highly recommend paudie.the floor was full all night. We could not recommend paudie enough. He IS the best DJ!! There was not a minute that nobody was on the dance floor he made sure that our guests were always up enjoying themselves. If I could I would give more stars I would! 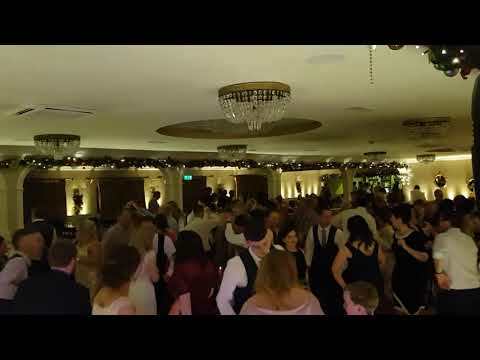 DJ Paudie was absolutely brilliant at our wedding in December. He was great to deal with and played great music and really had the crowd going. The dance floor was full all night. Paudie played at Charles brother's wedding in August and was so good we booked him for our wedding and did not disappoint. Everyone wanted to no who our DJ was at the end of the night. We would highly recommend Paudie for any couples looking for a DJ for there wedding. Extremely helpful, analyses the crowd for music options, great choice of music ???????????? Paudie was such excellent DJ, he really got the crowd going! He seemed to know exactly the songs which got everyone up dancing and honestly the dance floor was never empty! Friends and family are still talking about how good the DJ was! I would 100% recommend to a friend! Paudi was Professional,friendly,cool and knows his music and the crowd.Music was great and I don,t think the dance floor was empty all night. Start to finish Paudie is so professional. He is very accommodating and makes you feel very comfortable. Ppl were on the dance floor all night & no one wanted him to stop. I left everything up to him and he didnt let us down. We also got the photo booth last minute from paudie. Which was no bother to him and the photos are just hilarious. What I especially loved about paudie was his ending of the night with his personal touch to how he got to know us! Highly recommend! Paudie played for our wedding on 17-11-17. From the minute we contacted him he was brilliant, he was so professional and easy to chat with. He was absolutely brilliant on the night the transition from the band to DJ was seamless and from the very first song he had everyone on the dance floor. We've had so many guests commenting on how good Paudie was and how he was the best DJ they'd heard! The feedback was brilliant from everyone and the dancefloor was full all night. We couldn't have picked a better man for the job! He played a huge part in making our wedding so memorable. We would highly recommend Paudie. We really found this to be an excellent service. Everybody at the wedding commented on how good the night was and how much they enjoyed the DJ, and they really had a great time. And we really liked having the DJ for the full night instead of getting a band also. It worked out so much better and was everything we wanted. Paudie was brilliant and we would recommend him to anyone looking to hire a DJ. Great service and really enjoyed the whole night. I never normally go out of my way to do reviews or comment on pages but I have to say Paudie was THE most amazing DJ. He had everyone on the dance floor and has literally been the talk to the day! Thank you so much for making our day so special and fun! Paudie you are a legend! Booked Munster Dj Hire (Paudie Walsh) on a friends recommendation and couldn’t have been happier with the service he provided. He rang us after our initial booking to go over a few details of the day- the service he would provide and just a chat about what we were expecting. He told me he would be in touch 2-3 weeks before our big day to confirm everything with us. On the day he arrived early and set up with the band to avoid disruption to the music when the band finished.. He played an amazing set and has a great way of reading the crowd and really keeping the energy up and the dance floor full. He even came down to the dance floor to do his rendition of proud Mary which was very entertaining. He far exceeded our expectations and could have been happier with our choice, everyone commented on how good he was, a definite 10 out of 10! Paudie was absolutely fantastic, his energy and music choices kept the crowd going all night! His professionalism and help before the event helped me a huge amount to better organise the event. He was very easy going to deal with and over all a great dj. Would definetly recommend to a friend in the future and will use him if we ever have any big events again. Would def recommend Paudie to any couple getting married, his show is lively fun n gets the crowd going!! My parents are in their 60s n couldn’t stop talking about my DJ they love him!! WOW! Paudie was just fantastic to deal with from start to finish. We booked him for our wedding well over a year ago based on one of the many high recommendations myself and Lisa got for him. Spoke twice to him over that period and loved his calm and bubbly personality on the phone. Met with him once again just before Paudie started and again was a pleasure, putting me at ease on our stressful day. The highest complement I can give Paudie is that many people wanted to leave the dance floor but were unable to because the music was just too good. Some may be sending the bills his way for physio treatment!! Thanks for a great day. Worth every penny. Absolutely brilliant. Not like any other wedding DJ I’ve ever seen. All the guests commented on how good he was. I couldn't recommend Paudie enough. Brilliant, we had a full night DJ and photo booth from Paudie for our wedding in August this year. Brilliant to work with. Great nights entertainment both DJ and photo booth. Paudie had us all entertained and the dance floor was never empty. Love the book we got to keep with the print outs and signed by the guests. It is something to keep forever. I would definitely recommended Paudie for both. The night was a great laugh and everyone from young to old was entertained. I actually don't even know how to thank you, it was absolutely brilliant, you were amazing, I'm so happy we didn't have a band and we had you for the evening! I can't tell you the amount of people who came up to me that night and the following day asking about you, I actually couldn't have asked for better, so thank you sooooooo much!! Paudie is an amazing DJ! Book book book if you want a fantastic DJ for your wedding! Where do I even start one of the best decisions we made choosing paudie to be our wedding Dj. People are still talking about his performance on the night. The floor was full from start to finish the set, songs, timing, everything was perfect by him. The most fantastic Dj ever and I have since recommended him to other couples. Everyone needs a paudie as part of their wedding day!! Highly recommend. Paudie was such a pleasure to deal with in the run up to the wedding. He is so professional and rang to check through the type of music we would like. He came and set up with the band so there was so break in the music. Paudie had the dance floor full all night. We had guests with broken shoes and burst trousers from all the dancing-definitely a sign of a good night! 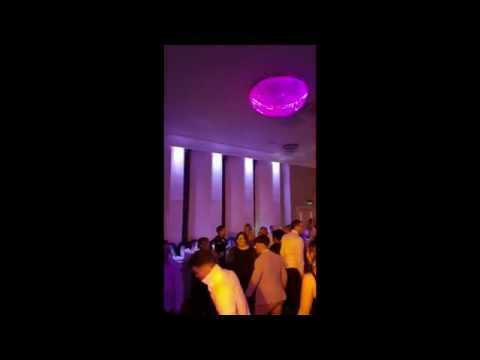 My friend from Australia Skyped and he brought the phone round the dance floor so she got to experience the night. Several of my friends have asked for his details. He catered for all ages and our parents friends were up dancing all night too. Thank you so much Paudie! Such a gent! Paudie was a fantastic entertainer . He kept the floor full all night, suiting the needs of all ages both young and old . Before the wedding , Paudie took the time to edit orur first dance as it was much too long . Paudie ensured the timing and clarity was absolutely perfect . So many of our guests were talking about how wonderful our dj paudie was after the wedding . Thank you Paudie for making sure we danced and partied the night away in style ! We booked Paudie for our wedding after meeting him at a wedding fair in the Charleville Park Hotel, and from start to finish he did not disappoint. He is professional and a pleasure to deal with and his energy on the night kept the dance floor busy. If I was to recommend a DJ I would look no further that Paudie, thanks for making a night to remember. Paudie, 5 stars isn’t enough for you!! What a Dj u are!!! Anthony and I honestly can’t thank you enough for doing such a fantastic job playing for our wedding! The dance floor was full all night and everyone at the wedding was wondering “who is the Dj” they were all raving about how excellent u are. Guys and gals,if u are looking for a DJ, you won’t find better!! We had a great experience with Paudie. We put all our trust in him to deliver a fantastic night and that he did. He ensured the floor was full all night. We decided last minute to include the photo booth with our wedding and were delighted we did, as the album is a great keepsake to look back over. We would highly recommend Paudie for anyone looking for a DJ for their wedding!! Paudie was absolutely amazing. He was able to read the crowd and had the floor hoping all night. He really interacted with people. I would highly recommend him. We booked Paudie after meeting him at a wedding fair in Charleville Park Hotel. He contacted us the week before the wedding to go through all the final details and was a pleasure to deal with. On the night of the wedding he provided an excellent set and it kept our guest dancing until the late hours. Thanks so much Paudie for making our night a memorable one. Paudie was a fantastic DJ at our wedding this summer. Paudie was organised in the run up to the big day and was ready and waiting to go when the band finished. Paudie had the dance floor full for the whole night, I didn’t even leave it myself! I would highly recommend Paudie to anyone planning a wedding! Words cannot describe how fantastic Paudie was at our wedding! Every aspect of communication was friendly and professional and I was happy to let him have control over the play list for the night. Best decision ever! The dance floor was full from the first song to the last and all our guests were so positive with feedback. I would highly recommend him to anyone looking for a high energy interactive DJ experience! Paudie finished off a great night in style! The music appealed to all ages and everyone danced the night away. Paudie really impresses. He was very professional and I would highly recommend him for weddings. Paudie was a pleasure to deal with in the run up to our wedding. His care and attention to detail was apparent from our telephone conversations; it mattered to him that everyone had a good night irrespective that they were dancers or not. And indeed, everyone had a brilliant night. He played to the crowd, made it fun for all ages and even managed to have one person who never danced throwing shapes on the floor! We have some lovely memories of our evening and our only complaint was that it didn’t last long enough!! Hi Guys! Thanks so much for those kind works. I am glad you and your guests enjoyed the night! The dance floor in Ballykisteen was rocking. Enjoy the honeymoon and best wishes for the future. No doubt I will be seeing you again soon. Paudie was absolutely brilliant at our wedding. He was a pleasure to deal with prior to the day and did an amazing job on the night, the dance floor was full all night with everyone up dancing! We also had the photobooth which was a great hit! Thank you Paudie! That's a big statement to make! But I will take the compliment! :) I remember from the first day we spoke I knew it was going to be a great night and mad party. That is exactly what it was! Thanks again for the booking and best wishes for the future. Wow guys! Thank you so much for those nice words. Delighted the guests loved the music! All the best for the future and hope to see you again! Since our wedding day I have been recommending Paudie. On the run up to our wedding Paudie checked in to check if we had any special requests. Nothing was a problem. It was a pleasure to deal with Paudie and I can see why he is an award winning DJ. Paudie judged our crowd very well and the dance floor was full all night. Paudie is very professional and entertaining. We highly recommend him as a DJ. We had a fantastic night of dancing and craic. What a fantastic entertainer Paudie was on our wedding day in Fota Island resort. From the very first phone call to Paudie he showed interest in our plans, wanted to know the type of music we liked and worked closely with us to ensure our big day was great. He even rang us a couple of days before the big day just to check in: We loved that – one less thing to worry about!! Paudie was excellent with all our guests but especially our children and made them feel special. The music and lighting was top class, he made a point to play our own personal requests but also our guests and there was plenty of music for all ages to really let go and when you hear guests talking about the entertainer afterwards you just know that it was a job very well done. A big thanks to Paudie for a wonderful job in looking after us, our family, our guests and working extremely well with the hotel – it was all seamless and very professional & I have no hesitation in recommending Paudie to family and friends and to potential clients. Paudie you are a true showman! 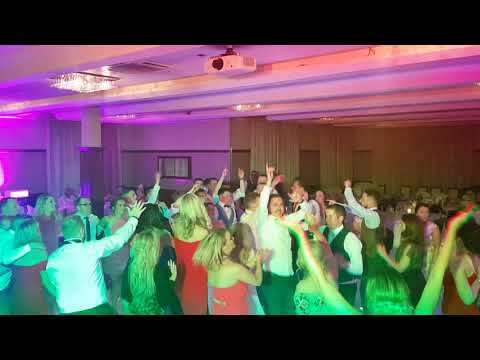 What an absolute pleasure you were to deal with and what a show you put on at our recent wedding reception in Killarney. You had everyone on the dance floor for the entire night with your fantastic set list. Our guests have been raving about you ever since. We can honestly say we will be highly recommending you to all of our friends. Thank you! Fantastic Night! We’d like to thank Paudie for an unforgettable end to such a special day for our wedding in December. From the moment we contacted Paudie he was helpful, informative, professional and great craic! I knew before he ever began djing that we were in for a treat and he didn’t disappoint. Paudie had all our guests, young and old, dancing the night away. He made us, as the wedding couple, feel extra special and we thoroughly enjoyed every minute of it! Thanks a million for the selfie! We would highly recommend Munster DJ Hire for anyone looking for a memorable event! We had Paudie at our wedding in Killarney, he did DJ and Photobooth Hire, I would 100% recommend Paudie for any occasion, we had an absolute blast on the dance floor, filled with all the music we love. Paudie did a 40min plus consultation prior to our wedding to go through who our wedding party was, special requests and to get a general feel for who we are as a couple. He truely reflected this in his music choice. The photobooth was a real hit with our guests as well and we have fantastic photo memories of everyone, even my 90 year Grandmother made an appearance with a wig & fez!! – Thank you so so much Paudie for making our night so memorable and special! It's hard to put into words how much Paudie made our wedding. All of our guests where and are still saying how brilliant he was. He had everyone on the dance floor, people who wouldn't usually get up, he included everyone in the room and gave great presance and energy. He is the best! Without a doubt would recommend him 10 times over! Paudie is one in a million! We booked Paudie for our wedding in September 2016. 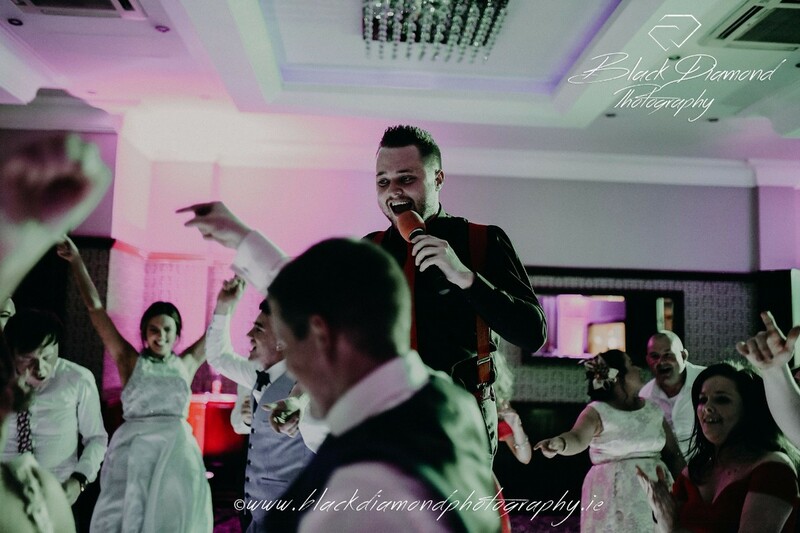 We highly recommend him for your special event as he was great with our guests throughout our reception and provided a wide range of music throughout the night for all genres. The dance floor was packed and all our guests were so impressed with him and the service he provided. Thank you Paudie for an unforgettable night. From Mr and Mrs Clifford. Paudie thank you so much for the fantastic DJ service at our wedding. You were brilliant and had the floor full from start to finish. We will definitely be recommending you to everyone! Paudie was the DJ at our wedding recently after we booked him along with the photo booth at a wedding fair. He was great to deal with in the run up to the wedding and was fantastic on the night. He was set-up and ready to go as soon as the band finished. The dance floor was busy all night and Paudie really played to the crowd. We were thrilled with the feedback from our guests and we would have no hesitation in recommending him to anyone looking for a really fun and professional DJ service! A massive thank you to Paudie for the fantastic entertainment at our Wedding. The floor was full, his energy and enthusiasm is fantastic and the craic was mighty! Thanks for ending our special day on a high! Will definitely be recommending you to friends! I booked Paudie to play for my wedding and I found him fantastic to deal with! He is a great DJ and can read the crowd very well. The dance floor was full from the minute he started to the end! We can’t thank him enough for the great job he did and would highly recommend him for weddings and other events! I can’t praise Paudie highly enough!! What an amazing Dj !! Everyone at our wedding was talking about how great he was!! We never left the dance floor I’ve the blisters to prove it!! Highly recommend him to anyone!! Thanks again Paudie and we loved our first dance thanks for mixing it for us!! Our wedding on 24th June 2016 was the most amazing day made all the more special by having Paudie as our DJ. He wasn’t your average DJ, far from it as the whole evening was tailored to us and our guests. We really could not have asked for a more professional service and were delighted with everything from start to finish. Paudie really catered for all of our guests and it was just brilliant to see the dance floor full all night long! All of our requests were met and all promises fulfilled, in fact our expectations were exceeded. We would not change a thing about our wedding day and we would like to thank Paudie for making our night so much fun! Hi Paudie, Shane and I would just like to say a huge thank you for the photo booth service and your outstanding DJ skills you provided at our wedding last June in the Lakeside Hotel. Dance floor was hopping all night with your great tunes and witty banter. Pics from the Photo Booth are hilarious! Any couples looking to book a one stop shop for entertainment, Paudie is your man, he won’t let you down! Thanks again Paudie and we wish you every success! Paudie what can i say, you rocked our wedding. Guests are still talking about you! Thanks so much for all the effort you put in, it really shows in your work. Id highly recommend you to anyone. Even to deal with you were so efficient and helpful. Thanks again! I first met Paudie at the UL wedding showcase and I must say I was so impressed with him after talking to him. I wasn’t getting married for over a year later but I decided there and then that he had to be at memoir wedding! He did our photobooth and DJ. The photobooth was a huge success and the book Paudie gave us at the end was fantastic. Now on to the DJ side! All I can say is WOW! The whole dance floor was packed to capacity all night and everyone said they have never seen it so full. He knew what songs to play and really got the crowd going. People are still talking about him! You definitely won’t be disappointed if you booked Paudie! All I can say is thank you so much for making my day extra special! We saw Paudie first when he did our friends wedding and knew that we had found a DJ that would be perfect for ours as well. Paudie is very professional as he arrives early, sets up with the band and takes over immediately when they are finished. We have nothing but good things to say about Paudie and many of our friends have enquired about him since as our dance floor was full for the night. 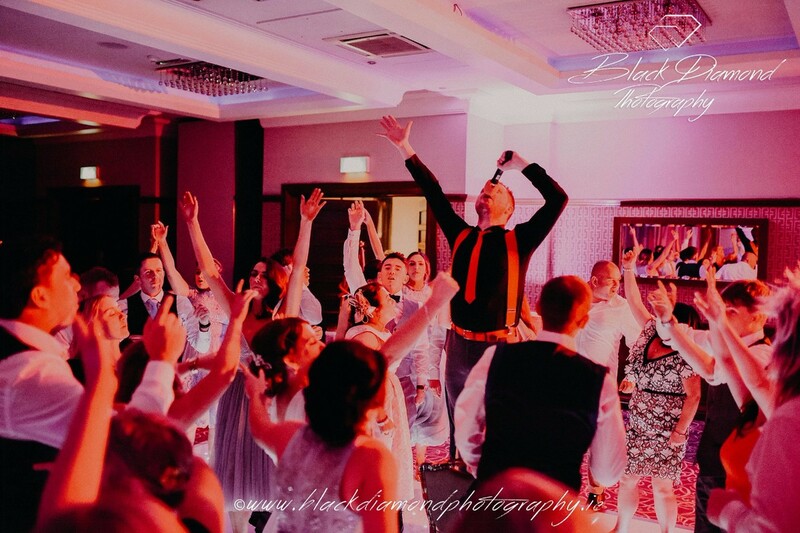 We have seen at various weddings, bands with their own Dj just set up a laptop and let it play while they are cleaning up but what Paudie offers will ensure your guests are left wanting more dancing. He interacts with the crowd and provides music that will suit all guests and most of all creates a party experience. We cant speak highly enough of Paudie and what he brings to a wedding. We would like to say a big thank you to Paudie for the fantastic music you played at our wedding! The dance floor was packed and there was a great mix of the latest music to some choons from our teenage years – teenage dirt bag and maniac 2000 made my night!! Paudie had great banter with the guests and was great to work with. 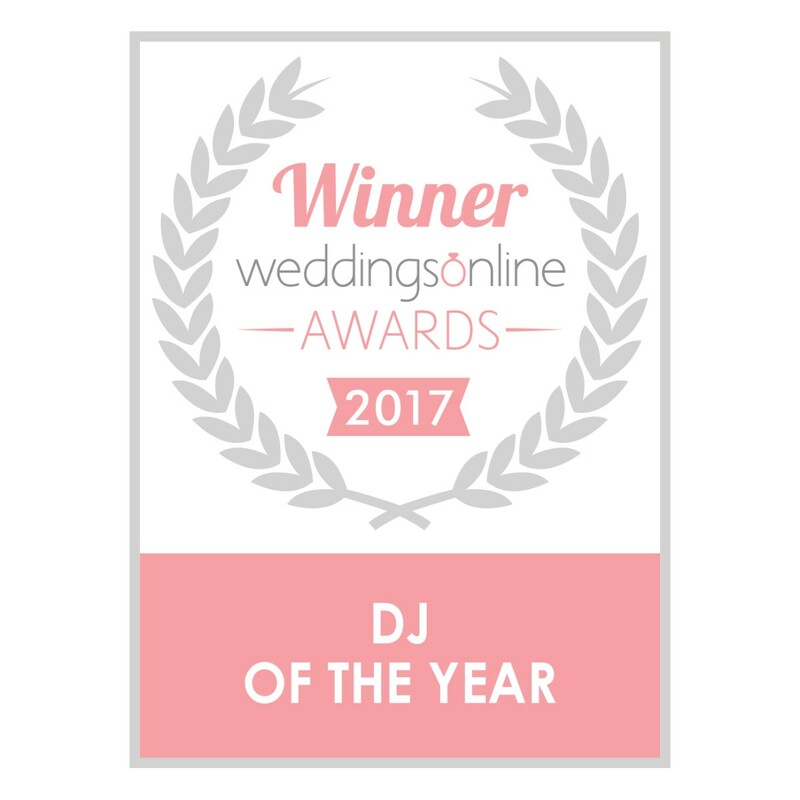 We would highly recommend him to anyone looking for a wedding DJ!! Paudie played for our wedding in Ballygarry House in April 2016 and had the place rocking from start to finish. He really knew how to get the crowd going and was very interactive throughout the night. He is great to deal with and we had a great laugh with him. We would definitely recommend Paudie for anyone looking to book a DJ for their wedding. It was a great way to finish what was a fantastic day. Uggie Uggie Uggie!!! Hi Guys! Thanks for that! Your night was so much fun! Great wedding in Ballygarry House! All the best. Paudie Oi Oi Oi!!! I booked DJ Paudie for my wedding in March. He played a great set and kept the whole group up and dancing til the wee hours of the night. Paudie has the unique ability to read the crowd and play exactly the right tune to prevent a lull from developing. Thanks for a great night! At the time we booked our wedding DJ, it was simply another thing ticked off the very long to-do list. Little did we know what a difference the DJ can make to a wedding. The floor was literally full from the moment he started to the moment he finished. Not only was it full but it was hopping! He read the crowd so well and the atmosphere was electric! I’ve never seen a DJ have such an impact at a wedding before, and I’ve been to a lot of weddings! So many guests commented on him afterwards. A few of my friends even wanted his details for their own weddings! An amazing DJ. Great tunes, mighty craic, professional service, thanks Paudie! We want to thank you for a wonderful night Friday night you did a great job keeping the dance floor full. Conor was very impressed with you!! I would highly recommend Paudie after he played at our wedding in December 2015 against the odds making it to Skibbereen in horrendous weather. He was great and knew how to read the crowd brilliantly (the only time he cleared the dance floor was when he played a request by me, the bride)! Paudie was extremely professional and approachable and I would not hesitate to book him or recommend him for another event. He was great fun too which always helps! Paudie I cant thank you enough for the amazing job you did playing for our wedding in October. You were amazing. The dance floor was full all night and you really played what the crowd wanted. I couldn’t recommend you highly enough. Wishing you all the success in the world. We booked Paudie to DJ at our wedding last August along with his fabulous photo-booth, which by the way is the best we have yet seen, and I cannot recommend him highly enough. From the moment we talked to him about booking to weeks after our wedding getting all our pictures on dvd he could not have been more professional. He made us feel so relaxed and he talked us through every step. Still 6 months on people are still commenting on how much of a great night they had and Paudie played such a huge part on that. Cannot thank him enough. Living happily ever after, Mr & Mrs Arnold ???? Hi Paudie, I can’t thank you enough for everything. You really made a difference to the day! We got married in August and you brought the photobooth (sorry for the delay in putting this review up). Every guest came back and told us how lovely you were, the photos and the album are brilliant and I’ve since heard that you went over and above your job to help us when things went wrong with the hotel and never even mentioned it. We honestly can’t thank you enough and would highly recommend you to anyone planning a wedding or any party! We were delighted with Paudie. He showed great attention to detail, he called us well in advance of our big day and offered us an opportunity to add some of our favourite tunes to the playlist. Also, he provided a great service on the night, worked very well with the band and got the crowd out on the floor. Overall – we were very pleased, thanks Paudie. We booked Paudie for our wedding at the end of March. He was very professional throughout the booking process and was excellent on the night. He played great music and got the crowd going! I definitely recommend him to anyone having a party or for their wedding! Thanks again! Just like to thank Paudie for a great night for our wedding in dingle.He had everyone up dancing all night. Would definitely recommend him to anyone. 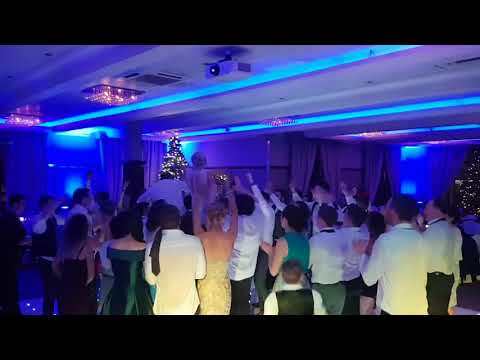 We booked DJ Paudie for our Wedding on the 24th April 2015, he was brilliant from start to finish, we gave him a list of some songs we wanted played, he played them and added plenty more classics, the dance floor was full all night and we were delighted with how he interacted with the crowd, he had no problem playing requests either. We also booked the Photo Booth from him. It was a real hit with the guests, it was busy all night. People keep telling us how great our DJ and Photobooth were at the Wedding. I would highly recommend DJ Paudie, he was so nice to deal with in the lead up to the wedding and on the night. Great value for money too. Would definately recommend Munster DJ Hire as the perfect wedding DJ. Paudie was professional and friendly. Kept in touch from the day we made the booking right up until the wedding day. There was a seamless transition from Band to DJ on the night and an excellent playlist! Something for everyone! Got married recently hired Paudie Walsh as the DJ. A great night was had by All. People still talking about how professional Paudie was and Id recommend him to anybody. Money well spent. Paudie was the DJ for our wedding on 26/09/2014. He provided a great mixture of music just like we asked him to. We were given the option of providing him with a playlist and he ensured that he included all requests on the night. The dance floor was full from start to finish and paudie had everybody in great spirits throughout! I would highly recommend munster DJ as we have used them on two occasions and were extremely happy with their service! Thanks Paudie for a fabulous night, you made our night and I think everybody should have you at their wedding, you were quite simply amazing!!! 5 star rating from me and my husband!! Hi Paudie thanks so much for your services for the wedding! You had the dance floor full all night!! Great energy and very enthusiastic person and that's what we love!! Thanks so much from myself and Michael! Paudie, Thank you so much for a wonderful night on Friday! You are such a talented entertainer/DJ- the dance floor was full for the night!! We had an absolutely amazing night!! I will be highly recommending you. Paudie played at our Wedding in May. What a professional!! He arrived at 6pm so he could survery what the crowd liked. He has incredible energy, great taste in music and has an amazing talent for finding the right tunes to have everyone dancing. He is more than just a DJ, he is a born entertainer! 2 engaged friends who were at the wedding have already booked him for 2015 after seeing him on the night. Paudie you were the making of our night! you had the dance floor packed and you had everyone from young and old rocking the night away! I have had several people come to me and ask about you so expect a busy few months!!! thank you so much for everything,you were a pleasure to deal with. Paudie played on after our wedding band and young and old rocked the night away. I will be using him again if he is available for any occasion or family event. Brilliant!